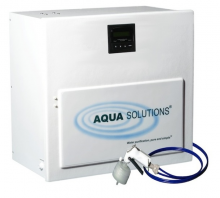 An RO system can effectively remove up to >95% of the contaminants in tap water, thereby reducing the operating cost of a DI system by more than 90-95%. It economically produces 40-Liters/hour of RO purified water by removing >95% of the contaminants in the incoming tap water. RO production is 40-Liters Per Hour. Pre-Filter Required (please see "Optional Upgrades"